I was at our community pool with my five children when I ran into an old acquaintance I had not seen in a couple of years. My eldest daughter and her little girl were in first grade together, back before our two adopted daughters had made it home from Haiti . We took a few minutes to catch up and for me to introduce her to my girls and then we said our good-byes and she began to walk away. Then, she stopped and returned to where I was. The woman, who is African American, said I just want to compliment you about your daughters' hair. It looks really cute. You know, so many times when white people adopt a black child, they don't learn how to care for the child's hair and it just looks crazy! Her voice was laced with concern as she continued on, I know a family who adopted their daughter as a baby and I promise you, I don't think that child's hair has been combed out in the last 12 years. I once heard an African American woman state that in her culture when a child is seen with hair that is unkempt it says to the world that the child is not receiving proper care. Over and over as I have read the stories of adult transracially adopted children, I have heard them say that their parent's inability to care for their hair was painful and made it more difficult for them to be at home among their black peers. It is absolutely essential that non-African-Amerian people understand this before they adopt a child of color. Our family is so blessed to belong to a church that is racially diverse. I understand that there are many white parents rearing black children who struggle to find diversity in their friendships and therefore, have no idea really where to begin when it comes to issues that are unique to the black experience. That is why I am going to begin sharing the wealth. This article is the first of a series on African hair care. We will begin with the basics and work our way up to more complex styles. So, join me each month as we make our babies shine! With your daughter in front of you, take the first braid in your hand and carefully remove the elastic band that secures the braid by clipping it with the scissors. 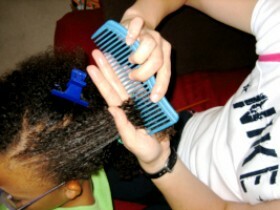 This is much easier on the hair than attempting to pull the elastic free which minimizes hair breakage. Apply a small amount of detangling conditioner to the braid to ease removal. Start at the end of the braid and use the pointed end of the rat tail comb to work the braid free a little at a time, stopping as needed to loosen any tangles with your fingers. Once the braid is completely unwound, comb through with the wide tooth comb and then secure at the top of the child's head with the clip so that it does not become tangled again. It is very helpful to always comb through the hair one section at a time and then secure the completed section with a clip before beginning another. Wet your child's hair with warm water. Rub shampoo between your palms and then begin to apply it to your child's hair. Begin to massage and clean your child's scalp with the pads of your fingers, not your fingernails which could scratch and injure the scalp. Once the entire scalp is clean, massage the hair to remove any product build up. Rinse, rinse, rinse! It is very important to remove all shampoo and if the hair is thick, this may be difficult. Keep at it until you are sure it is all gone. Apply a deep moisturizing conditioner and then place a shower cap on the child's head while you finish bathing the child. There have been times when one of my daughter's hair seemed particularly damaged from pool water that I actually allowed her to eat dinner while still wearing the shower cap to allow the conditioner to penetrate her hair. Remove the cap. At this point you may want to comb through the hair while the conditioner is still applied with a wide tooth comb. If so, begin at the end and work on only a 1/2 or so at a time, gradually moving up the hair shaft. As always, work with one small section at a time and then secure it at the top of the head with a clip once it is tangle free. Rinse the conditioner from the hair but do not over rinse. The hair needs moisture. Sherri Gragg and her husband Michael live in Franklin, Tennessee with their 5 children. 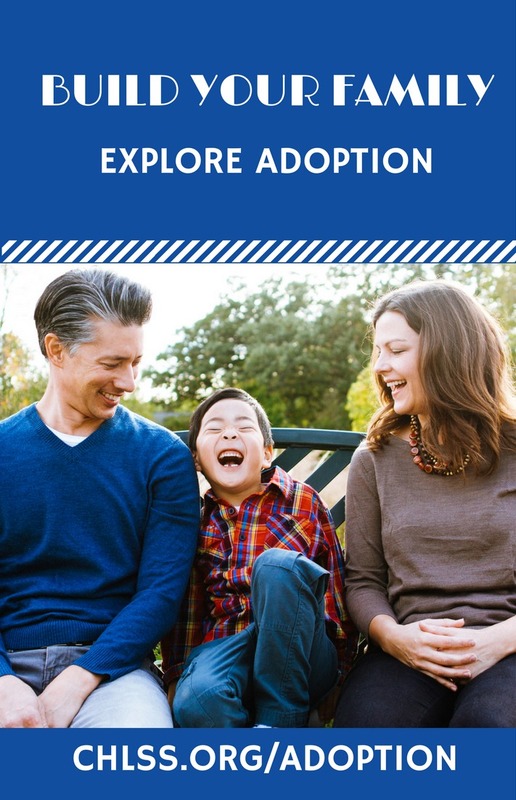 Sherri is part of the Voices of Adoption Community. Read more of Sherri's articles.